The Washington Department of Fish and Wildlife (WDFW) has estimated “Good” prospects for Chinook in Marine Area 1 during the month of July. Weather and wind has kept many of the small boats tied to the docks this week but those who have ventured out have done very well. Salmon continue to be very willing to bite. You will find Coho and Chinook up north on the beach around the casino. Fish in 30 to 60 feet of water. Divers and herring will be your best bet. Kings and Silvers will take these baits. For larger Chinook you will need to run out to deep water. 250 to 300 feet of water. These fish are still below 200 feet so you will need a downrigger to reach them. This is due to the warm water near the surface. Watch your Depth Sounder and you will see a Thermocline on your screen. Fish below that. Flasher and Hoochies are your best bet. #e made a run out this past week and it took longer to make the run out than it did to land our fish. 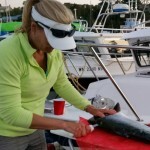 This weekend is the Annual Washington Tuna Classic to benefit Northwest Harvest and Warrior fishing Trips. This event is a lot of fun for the fishermen and the onlookers. If you are in the area stop by the docks and watch the excitement. Tuna are close in and most are running a mere 30 miles to hit pay dirt. Be patient and troll till you find the. This past Saturday marked the last day of chinook retention in Area 4. A spectacular season of king fishing meant the rather modest size quota ran out early in the season. Those who made it offshore on Sat. in somewhat snotty conditions were rewarded with good king fishing and decent coho fishing but it was too rough for many on the weekend to fish offshore. We got our Saturday kings on Swiftsure bank fishing flashers and choked herring at about 200’ of cable on the down rigger. Others did quite well fishing inside and I know of at least one 25-pound king that came off the edge of Waddah Island. While area 4 kings are no longer available, those who wish to fish out of Neah Bay for kings can still target them by traveling to Areas 3 or 5 (hatchery only in Area 5). 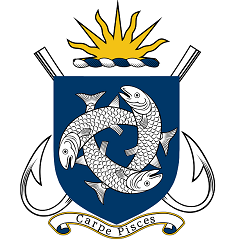 Some of the best large king fishing has been happening near the area 3-4 border so those who area fishing on the south side of that border can continue to do so. For those who wish to stay in the Strait and in area 4, pink salmon fishing is HOT, HOT, HOT! 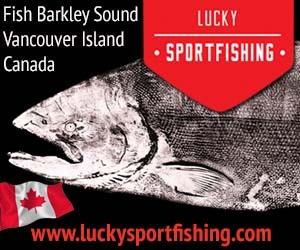 Pinks are spread throughout the strait and can be easily caught by any number of tactics. Pink hootchies behind red or green flashers at 65-80’ on the down rigger worked well for us on Sun and we quickly but 6 in the boat for 3 fishermen in the AM. We fished the tide rip that reliably forms on underwater extension of Kydaka point but pinks are pretty much every in the Strait. The pinks we caught we all running a bit small – but the catching was good and as they say “those will smoke up nicely”. Coho were a bit harder to come by (relative to pinks) but we did pick up several hatchery fish both on Sat on Swiftsure and Sun in the Strait. The number of coho is better than it was last week and will only continue to improve through August. While most of the coho are running in the 4-6# range at present, we did get one that was closer to 8. These fish will put on almost a pound per week during August so expect larger ones as the season progresses. To select for coho (and avoid pinks), try fishing in the upper 25-feet of the water column. We fished divers with choked herring out 35’ on the line counter. Report submitted by Big Salmon Resort. Lot of pinks being caught. A few Coho starting to show, although they are small. The Coho are usually caught early in the morning in the top 45 feet of water, but as the sun goes up, they go deeper. A few Chinook still being picked up by those trolling deep. To catch Humpies (Pinks), any lure with pink seems to work well. 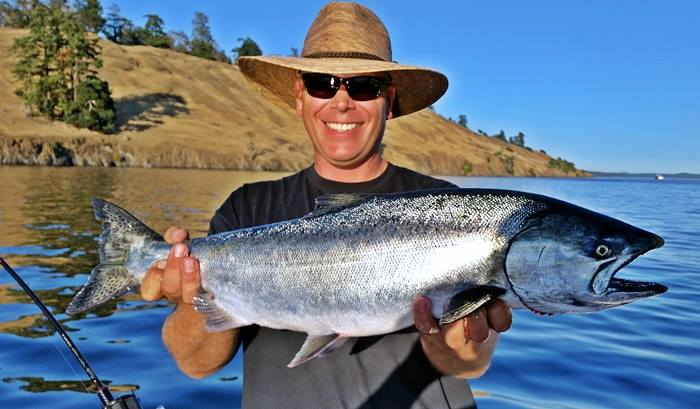 The Washington Department of Fish and Wildlife (WDFW) has estimated “Excellent” prospects for Chinook, Pinks, and Sockeye in Marine Area 6 during the month of July. Kris found a King. This weather, although bad for fish and fire, has been phenomenal. Vicki puts on a fillet show back at the docks. 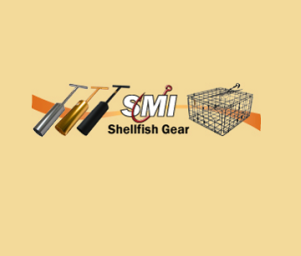 With a small folding table, it’s easy to get your catch taken care of quickly. The San Juans are lousy with Pinks right now. Tribal Seiner’s were working it hard this past weekend. We were able to mostly stay out of the Humpies by trolling 140’ to 160’ of wire, while looking for Chinook. Although, we still wound up with limits of them. Of course, casting lures on spinning gear can be pretty fun for the Pinks. Just look for the jumpers and huck a pink Buzz Bomb out there. Watch out for the kicker prop. The cover image of this week’s fishing report was contributed by Kevin Klein showing a Chinook captured using a Lurecharge Hootchie. Kevin says this was the hot lure last weekend. Submitted by Kevin Klein, Fidalgo-SanJuan Islands Chapter PSA, CCA Northsound. The cover photo of this week’s fishing reports was also submitted by Klein. Pinks, Pinks – everywhere! They seem to be able to hit every lure put into the water. While pink colored lures are absolutely the best for catching them, you can use any color lure and still catch them. A few Coho are mixing in the catch but are still very small, running about 3-5 pounds, but they will put on weight very rapidly in the next month. Pinks can be found from the surface down to 75 feet in good numbers. Some of the best fishing spots for Pinks are Lagoon Point, Mid-Channel Bank, Double Bluff, Point No Point and Possession Bar, in fact everywhere. Anglers fishing from the beach at Point No Point, Bush Point and Point Wilson are doing quite well for Humpies. Most are catching them on Buzz Bombs or floats and pink jigs. Check out the articles on the Salmon University website for information on catching Pinks (Humpies). Shawn Henschel score his catch jigging off Point Evans in 90 feet of water on Friday July 31. The salmon fishing has improved with fish being caught at the Clay Banks in 120-150 feet of water trolling flasher and spoon or flasher and hoochie on the bottom. 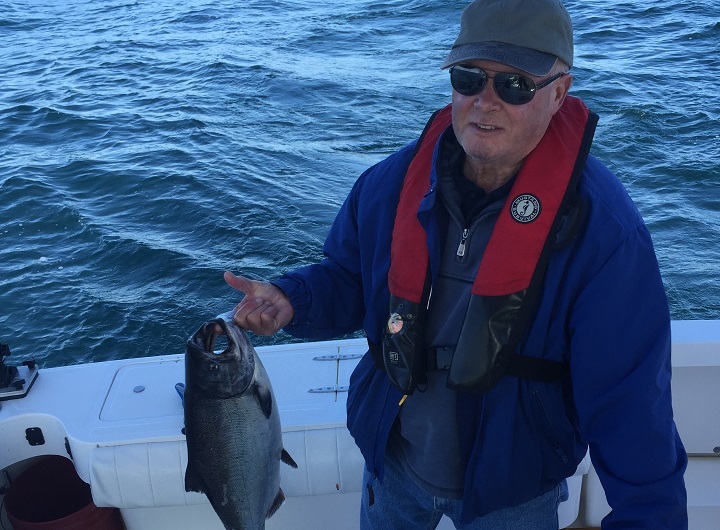 Jigging is effective at Point Evans for Salmon up to 21 pounds. Chinook are ranging from 8 to 21 pounds. Trolllers are also finding kings at the Girl Scout Camp and Gig Harbor Shoreline trolling 40-90 feet deep. A pink salmon are starting to show at Quartermaster Harbor and Dash Point Redondo Area trolling white flasher and pink squid. Dave Leavins caught this 18-pound chinook in 150 feet of water at the Point Defiance Promenade trolling on the bottom on Saturday with flasher and squid. Monthly classes (TBD) are offered to youth and for adults to prepare you to better take advantage of the fishing at Point Defiance and the local lakes and rivers. Learn knot tying, tackle, rods and reels, rigging techniques, regulations, and safety. Call 253-591-5325 to learn more about these classes. 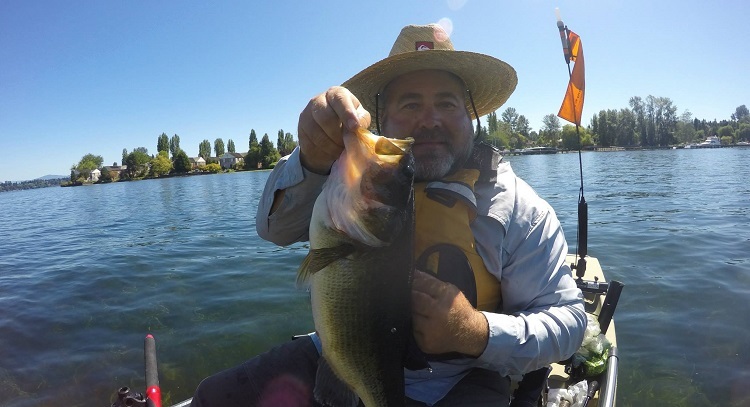 Call me crazy for booking a guided kayak fishing trip on Seafair weekend. My client and I hit the water at 7am. Not a boat in site. We worked docks around Madison Park and Leschi picking up several smallmouth bass. They were eager to grab any drop shot we threw at them. Many of the fish were in 12 to 20 feet of water. You know the fish are feeding heavy when they start coughing up small perch before you get them to the net. As the sun got higher in the sky we worked some shadier cover and pulled out a couple of nice largemouth bass on diving crank baits along the weed’s edge. The two landed were both paired up with a mate that refused to leave the side of my kayak until I let their buddy go. The boat traffic got heavier, the waves larger and it was time to give our attention to the Blue Angels from the safety of shore. High temperatures have kept fishermen away the past few weeks. This weekend Limit Out Marine put on a 5 fish boat limit on Potholes. What a catch with the winning boat limit for 5 bass weighing at over 26-pounds. The winning team was the pair of Levi Messeberg an Brian Baltzell. The smoke from the Chelan fire added the challenge of fishing with fog-like conditions. We were on the west side Friday through Sunday morning. Cresting the Vantage Hill we could see everything east of us was blanketed with smoke but not as bad as Saturday. We have been lucky until this past Saturday with almost no smoke. Now today the smoke has cleared off. There are still Walleye and Perch being caught using a bottom walker with a worm harness and night crawler. The lakes below the dam are full up with water as normal for this time of year. Favorites to consider would include Long lake but with the road on the north access being blocked because of fire danger you need to come I from the south. Also Soda has been good for Walleye, Perch and lots of smallmouth and with no pressure on any of these lakes. Salmon fishing was PRETTY GOOD in East Sooke. There are lots of pink salmon and boats are getting limit catches. The pinks are throughout the entire area so you don’t have to search very far to find them. The best fishing has been on the flood tide in the tide rips and tide lines. The spring salmon fishing picked up a bit. 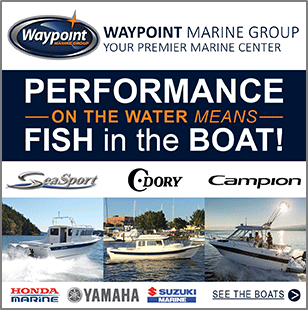 The best fishing there has been in tight to shore in 100 feet of water and between 40 – 70 feet on the downrigger. The best location for springs was between the Trap Shack and Beechey Head, but a big spring could show up anywhere. Most springs were running from 15 to 22 lbs in size. Anchovies were the most productive bait for the springs and No Bananas and Halloween Candy were productive teaser heads. However, spoons and plastic baits have been popular due to anglers switching to artificial baits because of the amount of bait needed to weed through all of the pinks! The Glow/Green Stripe hootchy has been effective for springs this past week. Spoons, in 3 or 4 inch size such as G-Force in the Outfitter or Trap Shack colours were effective. For flashers, the Lemon Lime, Betsey and the Purple Onion have been good. Salmon fishing was SPOTTY this past week. There were springs caught but fewer fish that during the previous week. 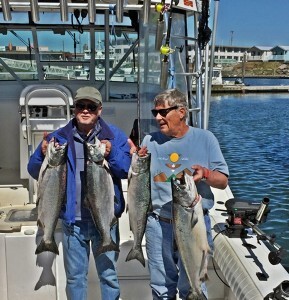 Most salmon caught were when fishing lures right on the bottom (60-120 ft) on the flats. The fish were hitting needlefish spoons as needlefish are the predominant in the area. Shelby Buckle landed her first 20 lb spring last Monday while fishing with her dad. Anglers also caught fish using G-force spoons in 3 -3.5 in No Bananas and Outfitter colours. Anglers that were jigging reported catching springs as well. Coho Killers in Gold Nugget and Green Splatterback have been pretty productive. The best flasher has been the Gibbs Lemon Lime and the Bon Chovy. Halibut fishing was SLOW this past weekend out in Haro Strait and off Discovery Island. Anglers that have been fishing are using mackerel, extra large herring, salmon bellies and/or octopus for bait. Berkley Gulp and Powerbait soft plastics also work very well. You can also use a large spoon fished off a spreader bar, Mudraker or Lucky Jigs or other large Jigs if you want to stay away from the dogfish. Josh Elburne (right) with his 28 lb spring. Fishing buddy Jackson Aexander is on the left. Salmon fishing was EXCELLENT this week. Limits of pink salmon, some nice springs, a few hatchery coho and some catch and release sockeye were reported at Pedder Bay Marina. Pedder Bay itself was the prime location to catch a nice spring, especially in shallow water between the marina and the Deep Hole. All of the pink salmon has kept the rental boat fleet very busy and there are usually waits at peak times. It’s a great place to take the family for lots of action. Anglers jigging bay were also catching springs and the Mac Fish and Gibbs Minnows were productive jigging lures. Don Crowe hooked a 30 lb spring while jigging of Christopher Point and he landed it near Church Rock! Anchovy was the most productive bait when trolling for springs with Halloween Candy and Bloody Nose being top choices in teaser heads. G-force spoons with both glow and green have been working as well and are getting more popular due to all of the pinks eating up bait. Flashers that remain popular include the Madi, Betsey, Lemon-Lime and the Purple Onion. Halibut fishing was SLOW this past week. Anglers that were fishing were using mackerel, extra large herring, salmon bellies and/or octopus for bait. Berkley Gulp and Powerbait soft plastics also work very well. You can also use a large spoon fished off a spreader bar, Mudraker or Lucky Jigs or other large Jigs if you want to stay away from the dogfish. Salmon fishing was GOOD near Sidney. The pink salmon have been running off of the Pender Bluffs and lots of boats are getting limits there. A few chinooks were brought in over the past week but not too many. The springs have been shallow, at 30 to 50 feet and in shallow water, first thing in the morning. The best locations for springs has been at Fairfax Point and Hambley point.Many anglers are fishing using anchovies in Bloody Nose and UV Green teaser heads. Squirts have been out-producing hootchies and the hot patterns for springs now are Purple Haze, J-79 and Electric Chair. Coho Killer spoons have also been working well, especially in double glow and Gold Nugget. The salmon fishing was VERY GOOD this past week. The pink salmon are still here and most Sooke anglers targeting them have reported limit catches! Now that the pinks are running, it is a great opportunity to get new anglers and kids out. The springs were in less common and scattered throughout the area. 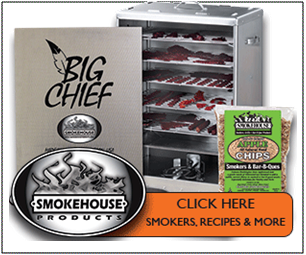 Most chinooks are weighing in the 20’s and teens. The bigger springs are being caught in the 35 – 60 ft depths. Brian Masuch picked up a 40 lb spring near Possession Point this past week. Too bad he didn’t catch during the derby. 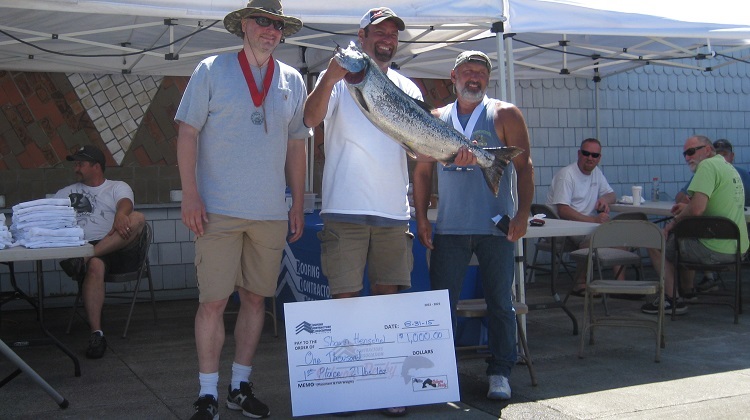 The Sooke Salmon Enhancement Society Derby was held this past weekend. First in the Open category was Brian Lacroix with a 28.65 lb chinook. Second place was Mark Purdy with a 27.9 lb chinook. Third went to Mark Cardinal with a 27.3 lb chinook. Ladies winner was Laura Lieph with a 20.75 lb chinook. Top senior angler was Richard Morin with a 22.45 lb chinook. Top junior angler was Togan Hack with a 19.9 lb chinook. Second place junior angler was Memphis Dawson with a 19.15 lb chinook and third place junior was Oliver Forbes Lucas with a 19.1 lb chinook. 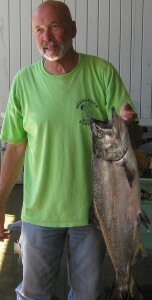 Largest hatchery fish winner was Michael Koff with a 23.1 lb Chinook. Fishing for springs was FAIR at Constance Bank if you could get your lure past the pink salmon. Springs are being caught both by trolling and jigging at the bank with the jiggers having an easier time of not hooking pinks. The pinks were less frequent this week off Victoria waterfront. The best spot to find the pinks has been in deeper water and along the tide lines. It’s still spotty for springs off the harbour entrance and the breakwater but some springs have been caught there. 13 year old Josh Elburne landed a 28 lb spring on Saturday morning near Macauley Point while using an anchovy in a Purple Haze teaser. Considering the number of boats out fishing, very few springs were caught with most fish weighing in the teens. .Anchovies, spoons and squirts were successful in getting hook ups. Good choices in plastic baits are the Electric Chair, Purple Haze and pink squirts. Gibbs Coho Killer, Sitka needlefish and Coyote spoons in green, moon glow and silver colours have been very effective. The Lemon Lime flasher with the Glow Green Splatter Back Coho Killer has been a very effective combo out on the bank. Effective July 4, 2015, virtually all angling in streams and rivers in Wildlife Management Units 1-1 through 1-6 is suspended. Trout fishing was GOOD on most lakes in the South Island area this past week. Bank anglers are catching trout on Powerbait, Gulp Eggs, or worms while fishing from shore and right on the bottom. Orange Garlic and Pink Garlic have been good choices recently for Powerbait. Fly anglers are fishing Pumpkinheads, Wooly Buggers, Leeches and Micro Leech patterns on full sink fly lines. Trollers have been doing well with Gibbs Gang Trolls and Gibbs Wedding Bands. Other good trolling lures are the Apex Trout Killers in rainbow, green or black and white patterns. Flatfish and/or Kwikfish have also been effective in sizes 5 to 7 in Frog, Black with Silver Flake or Rainbow Pattern. The biggest trout this year have come from Langford Lake. The Oregon Department of Fish and Wildlife (ODFW) reports that Spring Chinook fishing closed July 31 for transition to the fall season August 1. Expect slow fishing until later in August. Trolling herring or large bladed spinners are the two most popular techniques. Catch-and-release fishing for sturgeon is slow.